Can a paralyzed person run a marathon? A London woman wanted to find out, using a ReWalk robotic exoskeleton. Claire Lomas suffered a T4 spinal injury in a 2007 horse riding accident that left her paralyzed from the chest down. In 2012, she completed the London Marathon. What happened in between was the development of a robotic suit that let her tackle the challenge on her own two legs. It took 17 days for the 32-year-old resident of Leicestershire, England, to cross the finish line. 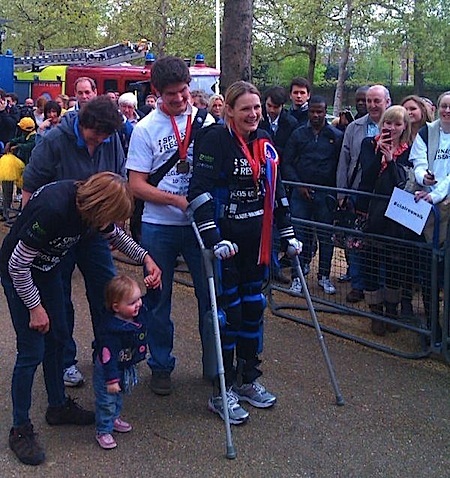 Her motivation for the marathon was to raise funds for spinal cord injury research. So far, she has raised nearly $200,000. This truly magnificent, romantically handsome, rather lean man was standing on two corrugated-soled titanium footplates. From the outer edge of each rose a narrow titanium T-beam that followed the line of his leg, with a joint (locked now) at the knee, up to another joint with a titanium pelvic girdle and shallow belly support. From the back of this girdle a T-spine rose to support a shoulder yoke and rib cage, all of the same metal. The rib cage was artistically slotted to save weight, so that curving strips followed the line of each of his very prominent ribs. Via CNEt; also, you can contribute at Claire Lomas' website.